Temperate mountainous areas of North America. Also closely aligns with woodlands and pairies. Not flood-prone area. Not a lot of snow. EMP scenario, but works well for many types of survival scenarios. Long-term survival (i.e. more than a year). Clothes are not listed. Female, infant, elder, handicapped, medical conditions are not catered too--I'm just not an expert on these needs. 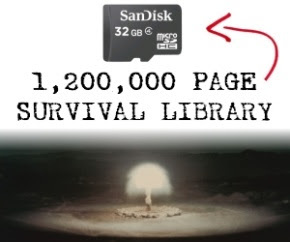 This is a one person survival list, but it also assumes you will add to your group over time. A year-round water source is nearby. Items are listed in order of importance, with most important listed first. camouflage netting for vehicle, campground, outposts, hunting, etc. Can you make it instead? Can you scavenge it instead? Is it a need or want? THANKS ALL. WHAT DO YOU THINK? WHAT DID I MISS WITH THIS LIST? BUG IN OR BUG OUT? THAT IS THE QUESTION.